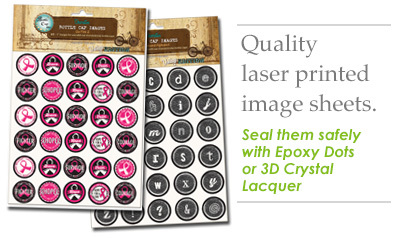 High quality laser printed bottle cap image sheets on card stock weight paper. Image sheets are a physical product that will be shipped to you. No printing required. Laser printed bottle cap images designed specifically for use with our mini, standard and over sized bottle caps! Your images sheet(s) will be shipped to you. This is not a digital file. You may use your images for finished craft projects and sale of finished "value-added" products freely, however, the copyright strictly prohibits reselling or distributing any of the designs as creative property or reselling of any portion of the image sheet itself in printed or digital form. No image or group of images may be sold under a designer's name, a small business or corporate label.